I'm here to do some myth busting. When I think back to my own thoughts about doing a lifestyle session in my home, 3 things seem to keep popping up. Today I'd love to address those concerns with the following images. 1. My house isn't clean enough. I recently took this photo of my boys. The image was taken close in to the subjects on purpose. As you see below my house was anything but cleaned up! A clean house certainly helps, but it doesn't have to be spotless, there are creative ways to avoid clutter. 2. There isn't enough light in my house. This room only has 2 small windows and the walls are rather dark. Below you can see that despite the lack of light my camera is capable of working well in low light situations. 3. My house doesn't look like Pintrest. Again here is a photo of my small messy living room. I recently took the photos below in this same room of my home of a client's 6 month baby. To clear the clutter, and make the baby our main focus, a lot of this room was moved into the room next to it. The toys were clean up off the floor. The boxes on either end of the couch, the trunk with books, and even the window photo frame on the wall, all were moved out. A house doesn't have to look like pintrest. The focus isn't the home but rather the interaction of baby and family. The emotion is what makes these lifestyle photos beautiful! Do you have a fear that I didn't address?! I'd love to be able to put to rest any concerns you might have that make you hesitate to schedule a lifestyle session. 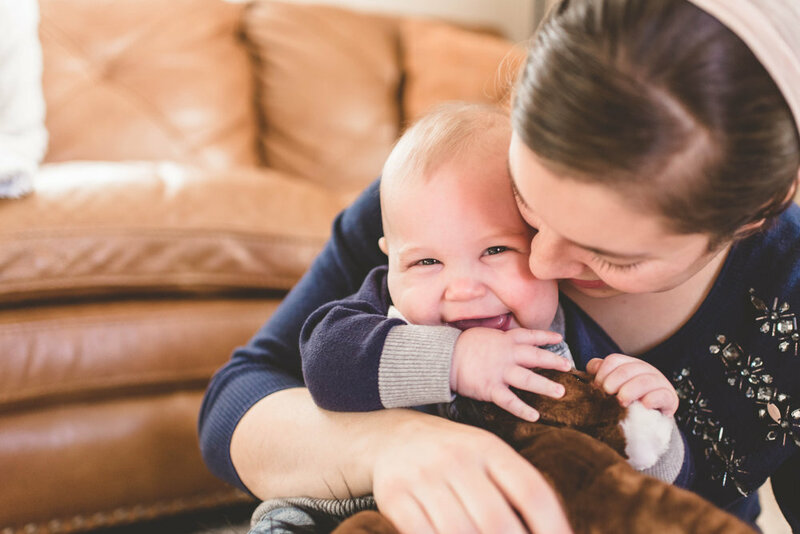 Contact me here to chat or to request a client guide, which has all the details and prices on a baby photo session with Sparrow's Flight Photography.